If I had to choose one magic system as my absolute favorite ever (I mean, ever), libriomancy would be a very likely winner. So you can imagine I was delighted to return to it with Jim C. Hines’ fourth Magic Ex Libris book, Revisionary. See my reviews for book one, Libriomancer, and book three, Unbound, and some spoilers inevitable below! Book three ended with the reveal of magic to the world at large, and now Isaac and his friends are dealing with the aftermath. Deep in magical research, Isaac wants to use magic for good but finds himself blocked by new rules and bureaucracy…but the rules go out the window when incidents of magical terrorism start to point towards an even larger threat. Like I said–I love a magical system built on books, and even more so because our narrator is a sci fi/fantasy geek who totally gets how cool all this is. Even more, I’m convinced Hines and I have read all the same books. If you pulled a random sampling of books, even popular ones, even fantasy ones, I still doubt the percent I’d read (and possibly loved) would be as high as it is with the books that appear in Hines’ series. References to Tamora Pierce, Robin McKinley, Catherynne M. Valente and Terry Pratchett have all appeared, to name just a few of my favorite authors! So–that continues to be awesome. Hines/Isaac start pushing the edges of magic in this book, expanding out beyond libriomancy’s original ability (pulling objects out of books). Isaac starts pulling spells or even ideas out of books–like the concept of technology breaking around magic. I love awesome dramatic magic and they do some cool stuff in here…but on the other hand, the original concept of libriomancy, with all its abilities and limitations, was just so freaking brilliant that I’m still not sure how I feel about messing with it. But it didn’t harm my enjoyment of the book! I loved how the world reacted to magic too. I’ve read many books about magic in a past era, or books where magic is a commonplace in the present and always has been, but I can’t recall one dealing on an international scale with the sudden reveal of magic in the present day. In some ways, the reaction was scarily believable. In the U.S., there are new laws regulating magic and complex clinical trials and approvals are now required to, say, use Lucy’s healing cordial from Narnia to cure someone of a heart defect. The situation is still in flux, and politicians are grappling with the rights of non-humans like sirens and vampires, and whether libriomancers should be drafted into service. Meanwhile in North Korea, the government has printed a propaganda-filled book designed to give their leaders great power and are forcing their citizens to read it (as libriomancy only works with reader belief behind it). Can’t you just imagine that happening? Isaac and his friends continue to be awesome, including his totally badass girlfriend Lena…who, by the way, is much more heavyset than that cover suggests. The cover actually quite bothers me on that issue; I love that about her, since it’s not what you typically see in fantasy. Also, Hines is super-aware of this kind of thing in an awesome way, so it surprises me! 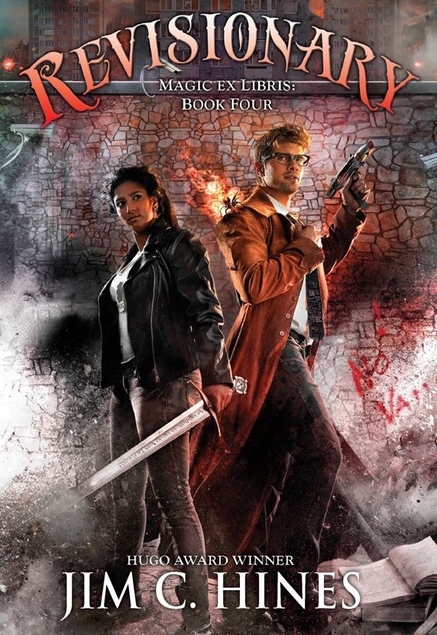 Cover issues aside… The characters are great, the plot is exciting, the magic is amazing, and I could gush a lot about the geekiness in here, but I’ll just give you one excerpt example instead. “Angels and ministers of grace defend us,” I muttered. Shakespeare references are cool, Star Trek references are cool, but both in the span of three lines? Epic win right there. Epic win book, actually, only it’s better if you start at the beginning of the series!